Introducing our English Rose tea ware collection; this beautiful rose branded range is the perfect all-year-round addition to your city or country house alike. The centre piece of any tea set, this delightful, smooth curved, fine bone china teapot adds a touch of beauty to tea time. The rose detail on either side gives this range a glimmer of elegance. 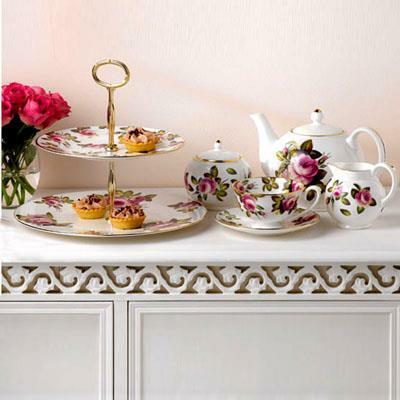 Complete range includes Tea pot, Milk Jug, Sugar pot,Teacup& Saucer, Mugs, Side plate (10’’ & 8’’) and cake stand.